The technique of soaking a food in a liquid to flavor it—or in the case of meats, to tenderize the cut—was probably brought to the Caribbean by the Spanish. 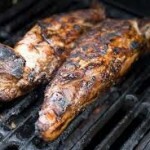 A marinade is easier to use than a paste, and when grilling your jerk meats, the marinade can also be used as a basting sauce. “In Jamaica,” notes food writer Robb Walsh, “like Texas barbecue, jerk is served on butcher paper and eaten with your hands.” Serve this version of jerk with a salad and grilled plantains. To make the marinade, combine all the ingredients except the tenderloins in a bowl, including the equivalent of 1/2 of a 1/2-inch cube of pulp, and mix well. 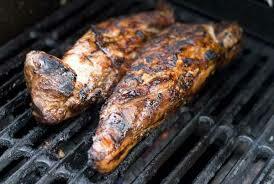 Taste the marinade for heat level and add more chile pulp if needed. Cut the pork tenderloins in half lengthwise and score the meat on each side of each piece. Place the tenderloins in a shallow glass bowl Add the pork tenderloins, cover them complete with the marinade, and marinate for at least an hour. Prepare a charcoal grill, adding 2 cups of soaked chips from lemon, orange or pecan wood. Grill over low heat until the interior reaches 140 to 145 degrees F., about 1 to 2 hours, depending on the heat of your fire. Baste the meat with extra marinade during the grilling process.